Need something portable to read during Fall break? Fall break is coming soon to Cornell Law School. If you’re traveling somewhere, have you thought about what you’ll read on the plane or listen to in the car? Cornell Law Library offers downloadable e-books and audiobooks for check-out via OverDrive to its students, faculty, and staff. Some of the currently available audiobooks include An Edible History of Humanity by Tom Standage, discussing food’s influence over the course of history, and the comic novel Company, by Max Barry. In e-books we have fiction, including the thrillers 12.21 by Dustin Thomason and Headhunters by Norwegian author Jo Nesbo, among others, as well as nonfiction such as Poor Economics: A Radical Rethinking of the Way to Fight Global Poverty by Abhijit Banerjee and Esther Duflo (“vital reading for anyone serious about confronting poverty”–Timothy Ogden, Stanford Social Innovation Review). Don’t see the title you want? Make a suggestion! Contact Nina Scholtz or Dan Blackaby with your suggestions, comments, and questions. 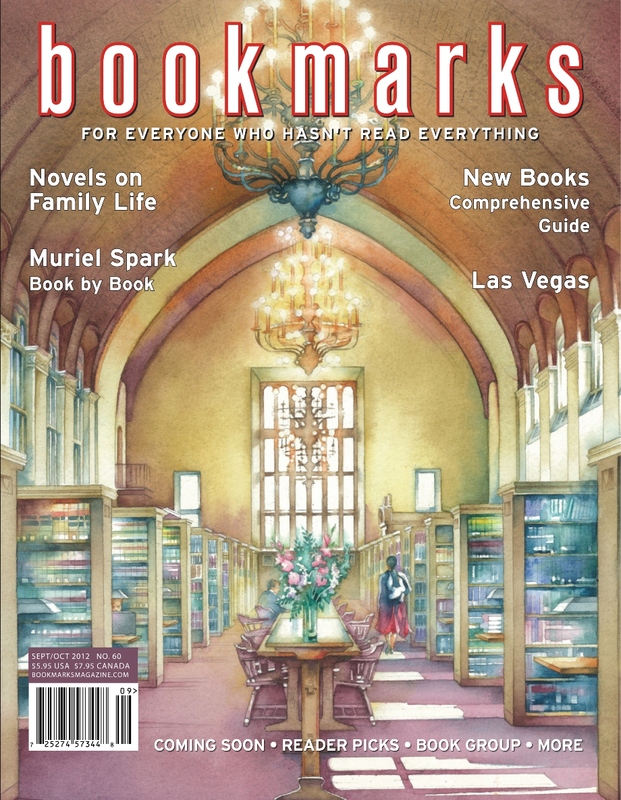 A local artist, Cheryl Chalmers, painted the beautiful watercolor of Cornell Law Library on the front cover of the September/October 2012 issue of Bookmarks. Cheryl’s gallery is near Taughannock Falls (see Cheryl’s painting of the falls). 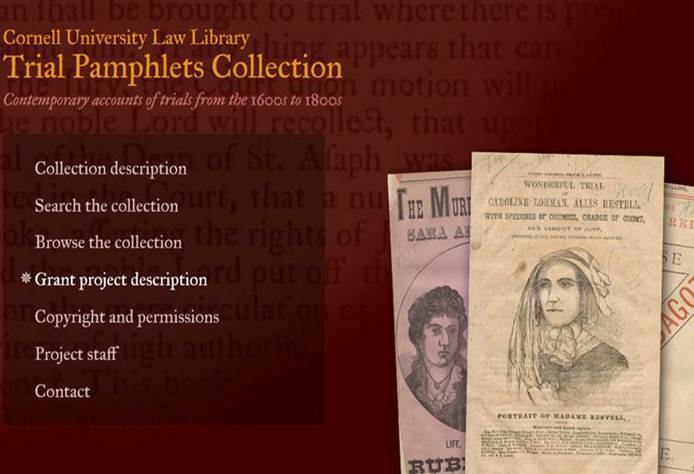 The Trial Pamphlets Collection is an exciting digitization project undertaken by the law library with funding of $155,700 from the Save America’s Treasures Grant Program. The digitized collection, drawn from our Special Collections, consists of pamphlets capturing a formative period in American history ranging in date from the late 1600s to the late 1800s. The pamphlets contained contemporary accounts of trials that involved prominent citizens or that dealt with especially controversial or lurid topics. We are indebted to Law Library Associate Director for Special Collections and Administrative Services Thomas Mills and the entire project staff for their remarkable contributions in making this project a reality. Additional content will be added in the upcoming months. 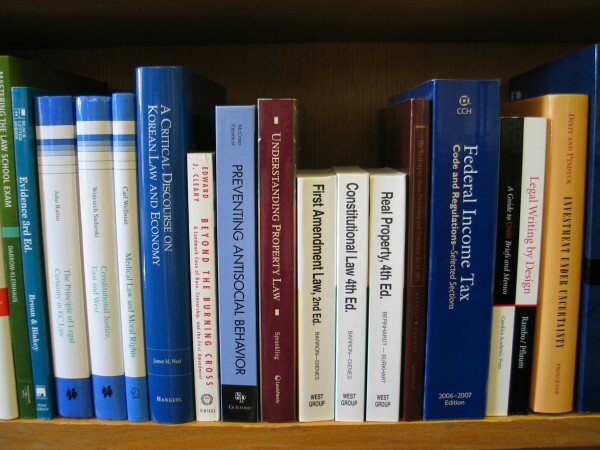 To visit the Trial Pamphlets Collection, go to: http://ebooks.library.cornell.edu/t/trial/index.php. Stop by the Reading Room to check out our book sale throughout the week of September 17, 2012. Most books will be priced at $1. Some books will be priced at $5. Cash only please.